Winter break, with all of its parties, outdoor activities and cozy days in is, sadly, coming to a close. While kids probably received some of what they need for the last days of winter as holiday gifts, now is a great time to fill any gaps in their winter wardrobe and make sure they have enough gear for school and weekends to get them through until spring. Keep reading to send your kids back to school in style! Kids love comfy clothes, and we love adding bright hues to bring life to short winter days. Start with leggings with a bit of extra detailing, add a knit dress in a loveable print, and make sure she’s stocked up on enough tees ( ruffles never hurt!) and sneakers to last the rest of the season. 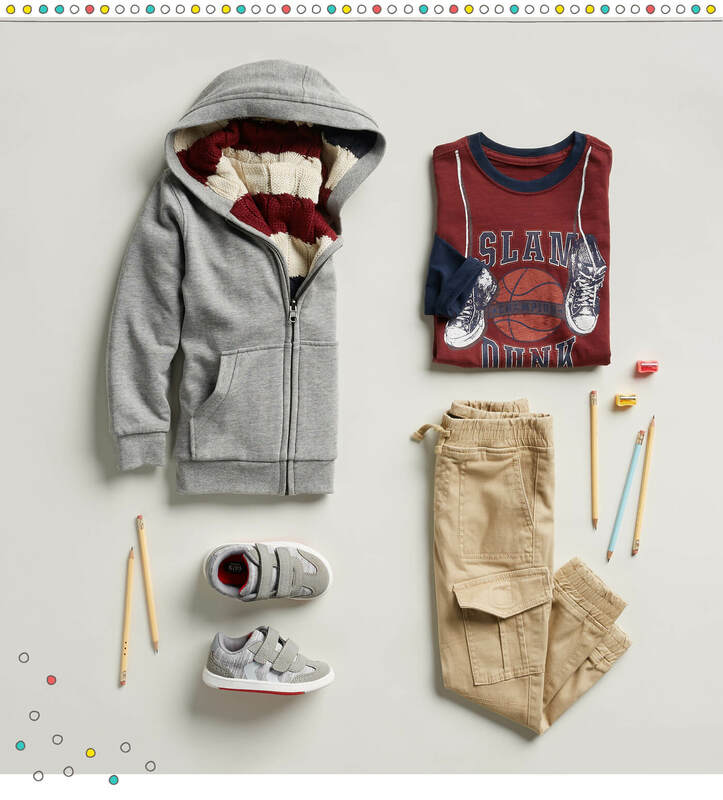 If you have a kid that loves sports and after school, rough-and-tumble play, fill their closet with athletic, warm pieces that will have them counting the minutes until recess. Layers are the name of the game, and it never hurts to have a stripey sweater and a cool grey hoodies to wear together or separately when it gets warmer. 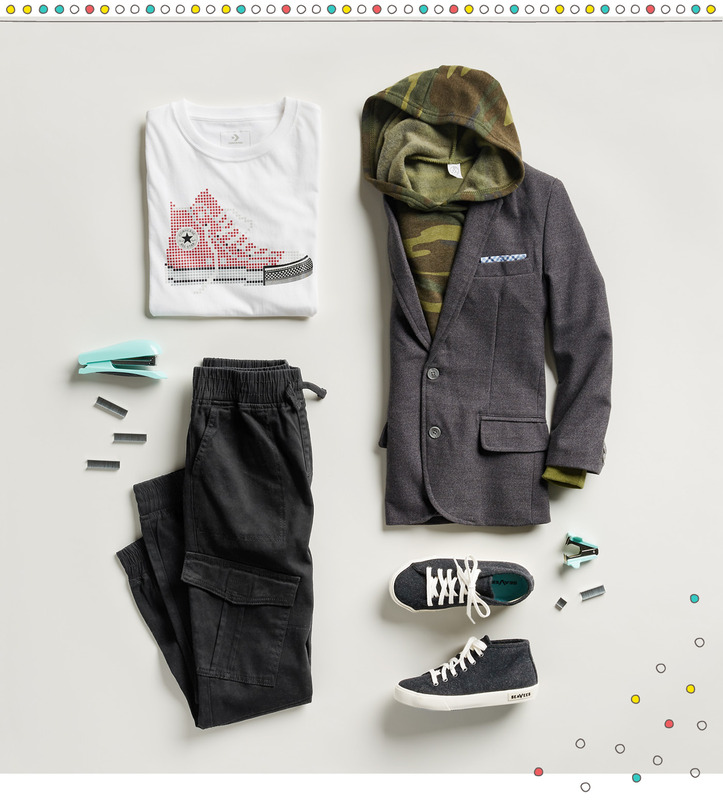 A pair of cargoes with lots of pockets, a sporty tee and some easy on, easy off sneakers round out this cool, casual look. 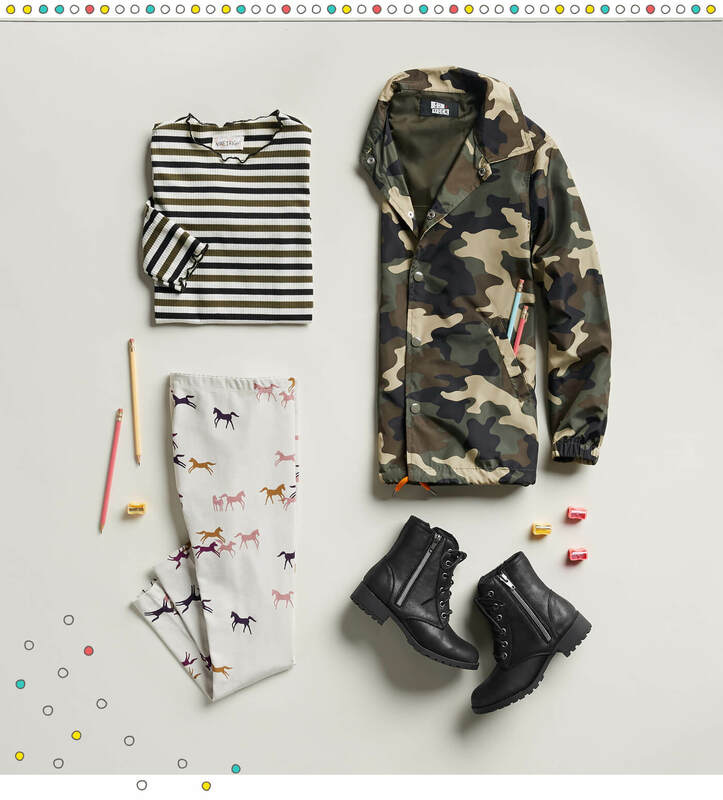 If you have a kid who loves up-to-the-minute trends, add a bit of camo to their closet. Here, a layerable camo hoodie looks great under a stretchy (read: super comfy) blazer. Graphic tees are pretty much a must-have for any cool kid, as are a high tops in basic black. Keep the comfortable theme going with drawstring pants that look good with a lot of different tops, and they’ll be stylishly set until spring. 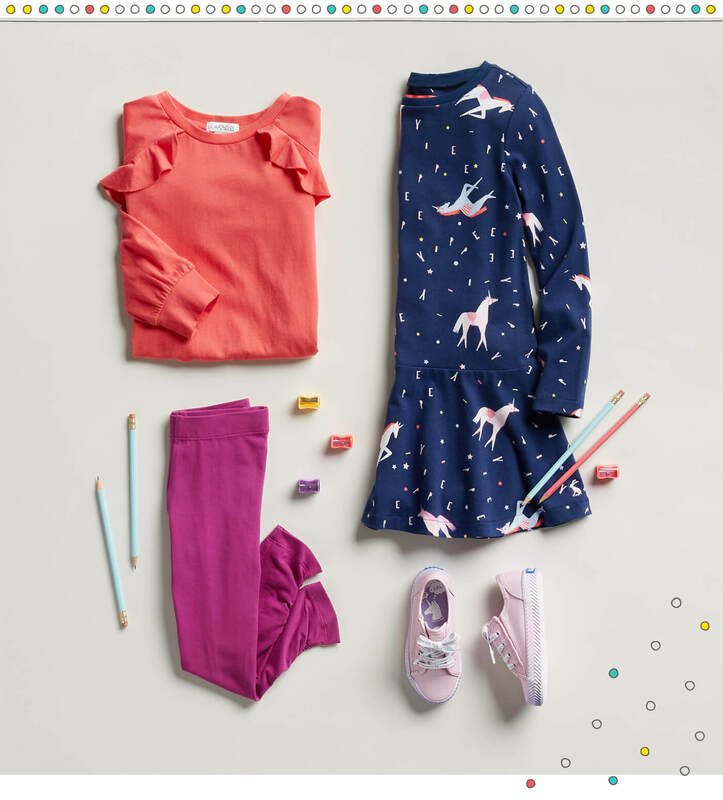 Print mixing is a great way to bring some fun into a kid’s wardrobe, and a general rule of thumb is to stick to a tight color palette when mixing prints and patterns. Make sure she earns an A+ in Top Trends 101 by starting with a striped tee (this one has a sweet, frilly neckline), and topping it with a camo jacket will make sure she earns an A+ in Top Trends 101. A pair of printed pants will look great with these pieces, as well as with a solid top, and a sturdy yet adorable pair of boots look equally great with pants and skirts. Ready to supplement their winter wardrobe with fresh, fashionable pieces perfect for the classroom, playground and weekend? Just ask their Stylist for winter-ready styles to hold them over until spring.